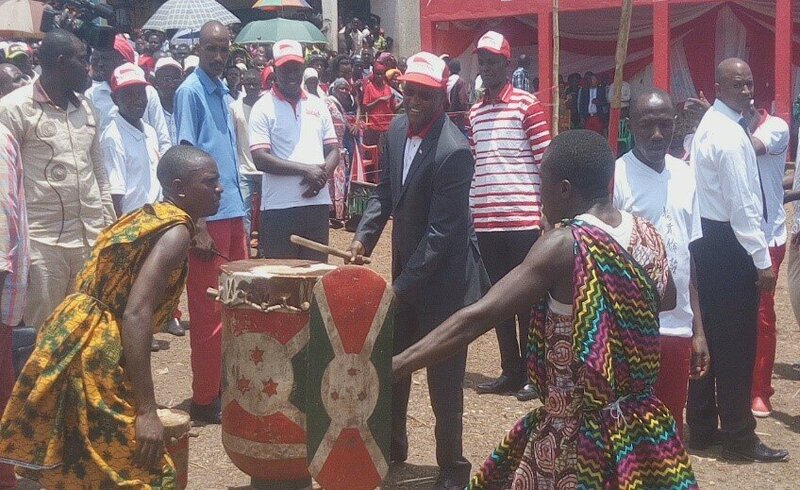 CIBITOKE March 27th (ABP) – The UPRONA party celebrated on Sunday March 25, 2018 at the headquarters of Mugina commune in Cibitoke province (northwestern Burundi), the 56th anniversary of its victory in the 1961 elections under the theme: “UPRONA at the service of the reconciliation of Burundians through a careful preparation of the 2020 elections”. The 1st Deputy President of the Republic, Mr. Gaston Sindimwo, a member of the party and present in those ceremonies, recalled in his speech that we cannot talk about the independence of Burundi without mentioning the UPRONA party because, he said, it is this party that fought for the independence of the country. He recalled that before Burundi won independence, the colonizers sought to divide the Burundian people by establishing, in 1929, tribalism between Burundians. Yet, he continued, Prince Louis Rwagasore, Pierre Ngendandumwe and their companions did everything to fight against this tribalism by engaging in a struggle for independence. The colonizers then got together with some Burundians, some of them from the Rwagasore family, and created a party, the PDC, which did not want Burundi to be independent. But independence was won thanks to the bravery of Rwagasore and the unity of Burundians. Unhappy with this acquisition of independence, he continued, the settlers eventually murdered Prince Rwagasore on October 13, 1961. His fellow, Mr. Ngendandumwe, took over by always putting forward unity, but he too was murdered. Those colonizers then broke UPRONA up to overthrow the monarchy in favor of the 1st Republic of which all the Ministers and new leaders of the UPRONA were those who rivaled Rwagasore. The same colonizers then introduced division politics by inculcating in the minds of Burundians that the enemy of the Hutu is Tutsi, and vice versa, he said, rejoicing that the Burundians have already noticed that this interpretation is not true. According to Mr. Sindimwo, the enemy of Burundians is hunger and poverty. Returning to the topic, the 1st Deputy President of the Republic called on the UPRONA members to be united and to love each other. According to him, the UPRONA activists must be characterized by mutual love and love of their homeland, like Rwagasore. He asked them not to be deceived by anyone because, he recalled, in 2015, there were people who pretended to be members of the UPRONA to deceive many people. He took the opportunity to make a strong appeal to any member of UPRONA who deviated from returning home to combine efforts for the construction of the country. All UPRONA activists, in particular and all Burundians in general, have been urged to safeguard unity to achieve sustainable development. Regarding the referendum of May 2018, Mr. Sindimwo invited all members of UPRONA and anyone who loves his country to respond to the referendum of May 2018 because, he said, there is no article in this new draft amendment of the Constitution which destabilizes the national unity and the sovereignty of the country. Similar tours had been carried out on the same day in all the communes of Cibitoke province where various executives of the central office of the UPRONA were deployed. 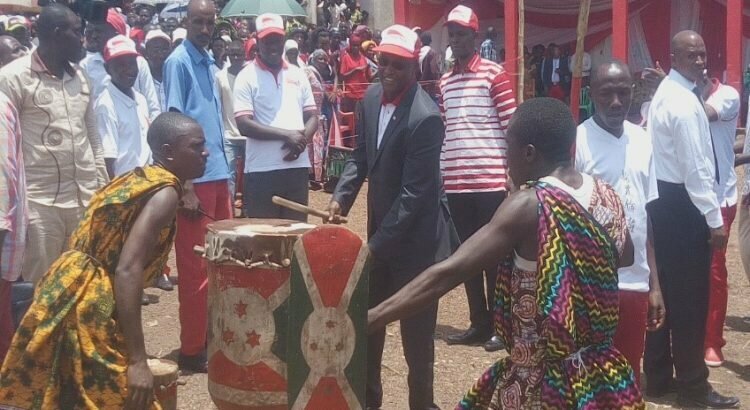 “Celebrating this date, which is reminiscent of 56 years of UPRONA’s victory, is an honor,” said UPRONA communal secretary in Mugina, Mr. Jean-Marie Hatungimana, in his opening address. He said that the UPRONA party is doing well in the Mugina commune because, he noted, all the committees exist and work well on all the hills. 71 new members from the FNL party and 80 others from other political parties were, on that occasion, welcomed within the UPRONA.